Yeah, but: It's the second-best in the area. The Long Version: This isn't a review of Toronto Life Square itself, which its patron, Toronto Life magazine, called "Suburban Brutalism" and "one of North America’s largest series of billboards". The food court – take-out restaurants with a common cafeteria-style 'dining' area – on the third floor is all I'm concerned with right now. The decor of the building is an interesting take on industrial-institutional minimalism. There's some effort to keep it as a flexible and open space, with most tables being bolted down contrasting with a section that's able to be re-arranged. The mechanical systems are left exposed, and about the only true decor is the patterning on the floor. The whole feeling is that the design choices were based on what will best endure the riot, but perhaps that's because of it's similarities to the design of the food court at the Scarborough Town Centre - before the renovations. Even after being there many times, I still can't quite make sense of the map. My impression is that it's very generous in its perception of space; the walkway between the two escalators is so narrow that when it gets busy - if it gets busy - there's bound to be problems with people waiting for food and people passing through. Both groups can get impatient and grumpy, so this doesn't seem like a great mix. It won't help that the escalator down is so hard to find that they've used decals on the floor to show the way to it, and now a large banner hangs over it. The overall result is an odd mix of open space and claustrophobia. Even at its peak, I've never seen the food court more than half-full. I've never had a problem finding a table, and there's never much of a line for food. Yet somehow the volume level during the lunch rush is always at a dull roar. I've measured it as between 76 and 79 decibels over the course of about half an hour, and the spot that I took the readings from is where the yellow paper is on the nearest table in the photo above. According to those arbitrary and imprecise charts that float around, this is something like eating lunch next to a running vacuum cleaner or dishwasher. Ordering food is difficult, and conversation is a challenge. It makes spending time in the area unpleasant, even more than the uncomfortable furniture does. Even when the food court is deserted, the mechanical systems are a strong addition to the ambiance of the area. I suppose sound-absorbing treatments wouldn't endure a riot. 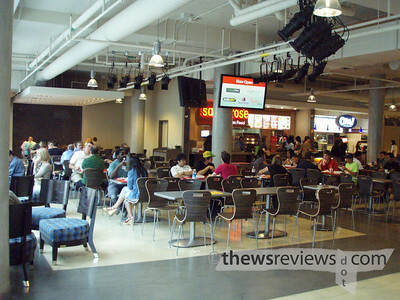 Updated December 2008: Since I wrote this review, the food court has become more popular, and they've had less need to run the A/C on full blast. So it's now less noisy in the off-time, and a little more crowded during the peak times. And as the days have gotten shorter, I've gained a new appreciation for the little area that has extra lighting. It's either set up as a study area for students from Ryerson, or as a way to discourage non-studying teenagers from loitering where they're secluded. Either way, it's a nice touch that I appreciate, and I've bumped the execution rating up to a solid average to reflect that. I've also had a chance to sample more of the cuisine; Subway is good but usually too crowded, Opa has become less of a personal favourite, California Thai is a favourite for myself and my co-workers (try the Ho Fun and/or green curry), and Caribbean Queen is also decent. Look for more reviews in the future. Updated Again, January 2013: Four years later this food court has become quite popular, and there are times when I need to circle around to find a seat. Part of its activity is because of the university that surrounds it on two sides; it's not uncommon to see students camped out for what must be hours at a time. Still, I do prefer this capacity reduction to having security guards patrolling to evict loiterers. 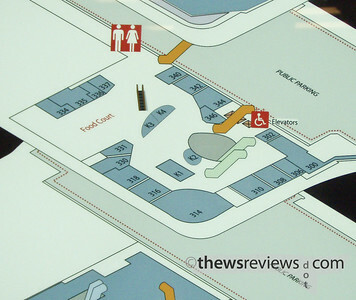 I've added an audio recording of the lunch-time ambiance to my sound blog: Robertson Sound - Food Court.